LLANDOVERY CASTLE (1) was built in 1914 by Barclay, Curle & Co. at Glasgow with a tonnage of 10639grt, a length of 500ft 1in, a beam of 63ft 3in and a service speed of 15 knots. She was the first ship to be completed under Royal Mail ownership following the takeover in April 1912 and the first solely designated for the East Africa trade. She was also the first ship to be given the name of a Welsh castle at the behest of the new Chairman Sir Owen Philipps, himself a Welshman, and it was his intent that the ship compete with the Deutsche Ost-Afrika Linie. 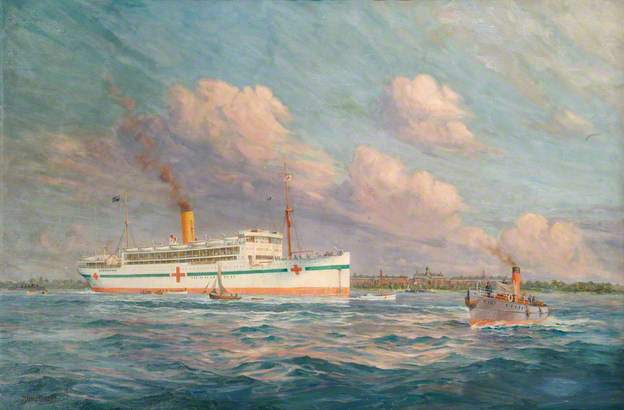 In 1915 she was transferred to the mail run when regular ships were requisitioned for war service.. She was commissioned as a hospital ship on 26th July 1916 with 622 beds and 102 medical staff and attached to the Canadian Forces. She became the company's last WW1 casualty when on 27th June 1918 at 9.00 pm whilst on a North Atlantic crossing from Halifax, Nova Scotia to Liverpool she was attacked without warning by German submarine U-86 (Kapitan Patzig) 118 miles southwest of Fastnet. She was displaying a brightly illuminated Red Cross sign and could not have been mistaken for anything other than a hospital ship. The ship sank within 10 minutes and not content with merely sinking the vessel Kapitan Patzig turned his guns on the helpless lifeboats and sank all but one. 24 people including the master, Captain Sylvester survived, being picked up HMS Lysander, but 234 others, including 88 medical staff, perished as a result of this act of German barbarity. Fortunately the ship was not carrying any patients. Two officers of the U-86 were jailed for four years by the German Supreme Court for war crimes but both 'escaped' shortly afterwards. 'The Union-Castle hospital ship Llandovery Castle bound from Halifax, Nova Scotia, for Liverpool, was torpedoed on June 27th, 1918, 114 miles south-west of Fastnet Rock. 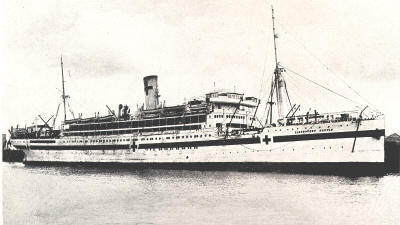 She had 258 people on board, including 94 medical officers and nursing sisters of the Canadian Medical Staff. It was 9.30 pm, a fine but dark night. The ship was displaying the regulation Red Cross lights. The explosion extinguished all the lights and wrecked the Marconi, so no S.O.S. signal could be sent out. Captain Sylvester, who was on the bridge, signalled to the engine room but got no reply. The torpedo had struck the after end of the engine-room, and made it impossible to put the engines astern so as to stop the ship's way. This, of course, made it dangerous to launch the boats, but it had to be done, as the ship was sinking rapidly. At least two of the boats were broken and swamped along the ship's side, but sufficient to accommodate the survivors seem to have got away. When it was reported to the captain that all others had left the ship he with the remaining ten men got into a boat and lowered themselves aft. They pulled away as hard as possible but when they were only fifty feet from the ship her stern went under, her boilers blew up, her bow stood up in the air, and she went down - about ten minutes after the torpedo had struck her. The captain's boat was now pulling to and fro among the wreckage picking up survivors. Among these was the purser, who had swam off to one of the boats containing several people. She (the lifeboat) had been injured (damaged) in the launching, and while he was holding onto her side she sank and rolled over on top of him; but he got clear and swam till he was sighted by the captain's boat. The submarine now came up and ordered the boat to come alongside. The boat's occupants, before obeying the order, were endeavouring to reach and save some others who were struggling in the water. But the order was repeated in a peremptory fashion, two revolver shots were fired at the boat, and a Hun officer shouted that he would "fire the big gun" at her if there was not prompt obedience. So the boat was compelled to desist from the work of rescue and went alongside the submarine. The captain was taken on board, and the Hun commander said to him, "You have eight American flight officers on board." Captain Sylvester denied this and explained he had only members of the Canadian Medical Staff with him. One of these, Captain Lyon, was in the boat, he was dragged on board the submarine with such brutal roughness that his foot was broken. He was accused of being a flight officer and denied it. Captain Sylvester was then asked if he had wirelessed. He replied that he had been unable to do so. Then he and Captain Lyon were allowed to return to the boat, probably owing to the intervention of the German second officer, who seemed friendly. He assisted Captain Sylvester to get into the boat, and said to him, "Get away quickly. It will be better for you." The boat pulled away, then the submarine acted in a strange manner. She dashed to and fro at full speed, probably among the other boats full of survivors; but it was too dark to see from the captain's boat what was happening. The submarine came alongside once more and this time the German's charge was that the Llandovery Castle had carried ammunition. This was denied. Then the submarine went away and resumed her strange manoeuvres. In the course of these she charged down on the boat at full speed, as if to run her down, and narrowly missed her. After this the submarine went away to the northward. Her commander, by the way, had been heard to ask his officers in which directions the other boats had gone, and they replied to the north. When about a mile off the submarine stopped and fired a shell, which passed over the boat. Then she fired about twelve shells in other directions, presumably at the other boats. Not one of these boats was heard of again. Out of the 258 souls who had been on the Llandovery Castle the 24 in the captain's boat were the sole survivors. After the war, the captain of U-86, Lieutenant Helmut Patzig, and two of his lieutenants were arraigned for trial on war crimes, but Patzig disappeared, and though the two lieutenants were convicted and sentenced to four years in prison, they both escaped. During the war no demand was more rightly made, or more constantly sustained, than that those who were guilty of crimes against the Laws of War and Humanity, both on land and sea, should be brought to justice. The demand was not confined to our own country. In the words of the notice issued by the French Government on 5th October, 1918, "acts so contrary to International Law, and to the very principles of human civilization, should not go unpunished." And as Monsieur Louis Barthou said on 3rd November, 1917, "There must be punishment, and it must be swift. When hostilities ceased on 11th November, 1918, this demand became insistent, and the Attorney-General of the day, now the Lord Chancellor (Viscount Birkenhead), set up a strong committee of lawyers to examine the whole matter, as well the legal position as the charges themselves and the evidence available to support them, and to report to him upon the steps taken to ensure that the "War Criminals," as they then had come to be termed, should be brought to justice. At the Peace Conference a commission was set up to report to the conference for the same purpose. At this commission, representatives of all the allied countries attended, and a report upon the violations of the Laws and Customs of War was duly made, with the result that Articles 228-230 were inserted in the Treaty of Versailles, which was signed upon 28th June, 1919. At the one of the earliest sittings of that commission in Paris, on 7th February, 1919, British delegates pointed out that, unless immediate steps were taken to arrest the War Criminals, the labours of the commission might prove fruitless. A suggestion was urged that a condition should be inserted in the next extension of the Armistice, whereby the enemy should undertake to hand over for detention and trial those persons whose names should be communicated from time to time. this suggestion of the British delegates was accepted by most, indeed by almost all, but not quite all, of the other countries represented on the commission. The matter was considered by the Supreme Council, but unfortunately no means were devised whereby, at that stage of the Peace negotiations, it was found possible to take speedy action. The German representatives signed the Treaty of the Peace at Versailles on 28th June, 1919. Owing to the delay caused by the illness of President Wilson and the working of the American Constitution, the Treaty did not come into force as between Great Britain and Germany until the 10th January, 1920. It was then, and not till then, that the clauses of the Treaty, under which Military Tribunals were to try persons accused of having committed acts of violation against the Laws of Customs of War, could be brought into operation. Those who were anxious to secure the trial of the War Criminals chafed at this delay. They appreciated the difficulties which the passage of time added to those already inherent in the matter. The delay gave the opportunity for escape to those who must have been conscious that their names would figure on any list presented under Article 228. The repatriation of the prisoners of war dispersed among the many Dominions of the Crown the men who had come from every part of the globe to fight for the great cause of civilization; and this, as well as the demobilisation of the fighting forces, all rendered the task of collection the evidence and securing the attendance of witnesses before any tribunal, tenfold more difficult. As I said above, the demand was that the War Criminals should be brought to justice. No doubt if the was had been continued for the purpose--at the cost of additional lives and treasure--it would have been possible to have insisted that a number of those against whom allegations were freely made should have been surrendered and tried off-hand at a drum-head court-martial. Or, if the surrender of the same criminals had been demanded as a condition of the extension of the Armistice, and some sort of trial immediately improvised, a number of those against whom the charges were made could have been summarily convicted and punished. Once, however, the clauses had been inserted in the Treaty, it was essential to adhere to their terms; more especially as those against whom they were directed were charged with having disregarded not only the usages of war, but also the conventions laboriously worked out and assented to by civilised nations--whether at Geneva, or at the Hague. Immediately after the Treaty came into force, in January, 1920, the list of those demanded by the Allies was prepared, and ultimately submitted to the Germans. The list was a long one, not unnaturally so, because the tale of barbarities against Frenchmen, Belgians, the British and Italians, was itself all too long. The German Government represented, and their representations were accepted by the Supreme Council, that if they attempted to arrest many of those whose names figured upon the list, it would bring the Government--none too stable--to the ground. They made a counter proposition that they should have the evidence submitted to them, and try before the Supreme Court of Leipzig those against whom the charges were made and whom they undertook to arrest and bring to trial. The Allies tentatively accepted this proposal and presented a list of forty-five cases to be tried by way of experiment before the Supreme Court. They made it plain, however, that though they would supply the evidence they left full responsibility to the Germans. This point is of some importance because it has been suggested that the Allies were in a position to direct or interfere with the course of the Court at Leipzig. No self-respecting Court could be asked to allow such interference; and for foreigners to intervene before a tribunal, with whose practice and procedure they were not familiar, would have been a court disaster. The British cases, six in all, were ready first. They were chosen as representative of the charges brought against the War Criminals. Three of them were charges against the commanders of submarines. Three cases related to prison camps. These were selected because they were free from the complications which occur in some of the other prison camp cases. Heynen, Muller, and Robert Neumann in the prison camp cases were all convicted, as well as Dithmar and Boldt, who were arrested by the Germans themselves for the complicity in the outrage committed by Lieutenant Patzig in the firing on the life-boats of the SS Llandovery Castle. The proceedings of the Supreme Court at Leipzig have been appraised in this country somewhat superficially by those who took note only of the sentences. These sentences were, to our estimate, far too light: but as the following pages show, they must be estimated according to their values in Germany. To the Germans a sentence of imprisonment upon an officer carries a special stigma, and imports a blot upon the service to which he belongs. No sentence could be adequate or expiate the outrages committed: no time will efface the memory of their sufferings from those who underwent them. If we has sought vengeance, no system of trial or punishment would have satisfied our thirst for justice--for British justice, under which the defendant should have an opportunity of stating his case, and be condemned only after a fair hearing ­ the justice that reaches its end. Those who were present in the Court at Leipzig are able to form a better estimate of the effect produced at the trials upon the public who attended them. No newspaper report can adequately convey the sensation which was produced from time to time by the Court accepting the evidence of the British witnesses as trustworthy, and the President turning short upon the prisoner for his answer: "Here's a respectable young man: did you hit him?" the prisoner: "I don't remember." The President: "Then if you don't remember , I don't believe you." Or again, from the President's retort to the counsel, in the Boldt and Dithmar case, who suggested, upon hearing the evidence that Meissner, the best gun-layer, now dead, had been summoned to the deck of the submarine, that it was probably he who had fired the gun and did the outrage--"Don't imagine that you are going to get rid of this terrible affair by trying to put the blame upon a dead man; that won't do." These and similar incidents had their effect on the Germans who attended the trials on Court and upon the Germans throughout the country. For my own part I was alike disappointed and surprised that longer sentences were not administered in some of the cases. With the assistance of Mr. Claud Mullins, the writer of this book, and others, I was able to follow the trials accurately and minutely. I owe much to his intimate acquaintance with the German language, and his accurate and pains-taking scrutiny of the German code. Thus equipped I can say, as one who was present at most of the trials of the British cases, that it has been established before the Supreme Court of Germany--equivalent to our House of Lords or Privy Council--that the charges that were made against the Germans in the course of the war were well founded, that the evidence of the British witnesses who gave evidence at the trials was accepted as trustworthy, and that the convictions secured in Germany itself--few though the cases tried have been--have resulted in an admission of guilt. The true object of a conviction and punishment is that it shall be a deterrent against the repetition of similar acts. If the trials had taken place in London, the probability is that the Germans would have asserted that the trials were unfair, and Built a memorial in Berlin to those who were the subjects of them. Now it can be said before the whole world that it has been proved in certain representative cases that the Germans were guilty of breaches of the Laws of War and Humanity. It is the purpose of this book to give an accurate record of these cases. Those who are prepared after considering the following pages to look for the permanent results of the trails, and not to form hasty or superficial judgements, will perhaps share the view that so far no small achievement has been accomplished, land that, even if in a few cases only, justice has been asserted. Probable as the war justice has been asserted. Probable as the war recedes this achievement will sand out as more important than at the present time, for though the terms of imprisonment, measured by the whatever standard, must pass away by lapse of time, the effect of the convictions will stand forever. This trial was held after the Belgian and French trials. It was in some respects the most important of the British cases. But before dealing with the facts, it is desirable to recall that, as explained the introduction: this trial was not held at the instigation of the British Government. The commander of the U-boat 86, Commander (then First-Lieutenant) Helmut Patzig, was on the list of accused persons submitted by this country. His home was believed to be in Danzig, though relations of his lived at Weimar. Danzig was separated from Germany by the Treaty of Versailles and at the time of these trials it was not known where Patzig was living. The German authorities made inquiries among the crew of U-boat 86 and thus collected evidence which supported the charges made by the British Government. On their own initiative, therefore, they arrested the two other officers of the submarine, Dithmar and Boldt, and requested the British Government to send the British Mission again to Leipzig and to supply the evidence available against Leipzig and to supply the evidence available against Patzig. Dithmar was still in the navy and appeared in uniform at the trial. Boldt had retired and wore a over-coat, with his Iron Cross pinned on his lapel. "Up to the year 1916 the steamer "LLANDOVERY CASTLE" had been used for the transport of troops. In that year she was commissioned by the British Government to carry wounded and sick Canadian soldiers home to Canada from the European theatre of war. The vessel was suitably fitted out for the purpose and was provided with the distinguishing marks, which the 10th Hague Convention requires in the case of naval hospital ships. The name of the vessel was communicated to the enemy powers. From that time onwards she was exclusively employed in the transport of sick and wounded. She never again carried troops, and never again had munitions on board. There can be no doubt about it. At the end of the month of June 1918, the "LLANDOVERY CASTLE" was on her way back to England from Halifax. She has on board the crew, consisting of one hundred and sixty-four men, eighty officers and men of the Canadian Medical Corps, and fourteen nurses, a total of two hundred and fifty-eight persons. There were no combatants on board. The vessel had not taken on board any munitions or other war material. This has been clearly established. In the evening of 27th of June, 1918, at about nine-thirty (local time) the "LLANDOVERY CASTLE" was sunk in the Atlantic Ocean, about one hundred and sixteen miles south-west of Fastnet (Ireland), by a torpedo from the German U-boat 86. Of those aboard only twenty-four persons were saved, two hundred and thirty-four having been drowned. The commander of U-boat 86 was First-Lieutenant Patzig, who was subsequently promoted captain. His present whereabouts are unknown. The accused Dithmar was the first officer of the watch, and the accused Boldt the second. Patzig recognised the character of the ship, which he had been pursuing for a long time, at the latest when she exhibited at dusk the lights prescribed for hospital ships. In accordance with International Law, the German U-boats were forbidden to torpedo hospital ships. According both to the German and the British Governments' interpretation of the said Hague Convention, ships, which were used for the transport of military persons, wounded and fallen ill in war on land, belonged to this category. The German Naval Command had given orders that hospital ships were only to be sunk within the limits of a certain barred area. However, this area was long way from the point we have now under consideration. Patzig knew this and was aware that by torpedoing the 'LLANDOVERY CASTLE' he was acting against orders. But he was of the opinion, founded on various information (including some from official sources, the accuracy of which cannot be verified, and does not require to be verified in these proceedings), that on the enemy side, hospital ships were being used for transporting troops and combatants, as well as munitions. He, therefore, presumed that, contrary to International Law, a similar use was being made of the "Llandovery Castle". In particular, he seems to have expected (what grounds he has for this has not been made clear) that she had American airmen on board. Acting on this suspicion, he decided to torpedo the ship, in spite of his having been advised not to do so the accused Dithmar and the witness Popitz. Both were with him in the conning tower, the accused Boldt being at the depth rudder. The torpedo struck the "Llandovery Castle" amidships on the port side and damaged the ship to such an extent that she sank in about ten minutes. There were nineteen life-boats on board. Each could take a maximum of fifty-two persons. Only two of them (described as cutters) were smaller, and these could not take more than twenty-three persons. Some of the boats on the port side were destroyed by the explosion of the torpedo. A good number of undamaged boats were, however, successfully lowered. The favourable weather assisted life-saving operations. There was a light breeze and a slight swell." "From the statement of the witness Chapman, in conjunction with other evidence, it may be concluded that of the boats on the starboard side, three (marked with odd numbers) were got away undamaged with two of the boats on the port side (marked with even numbers). Chapman, who was second officer on board the "Llandovery Castle" has impressed to the Court as a quiet, clear-headed and reliable witness. The evidence has also shown that he did not lose he head while the ship was sinking, but that he coolly took all the necessary measures. Confidence can, therefore, be placed unhesitatingly in he evidence. He saw five boats lowered from the starboard side, two of which, however, capsized, so that three got away safely. Two boats, got away from the port side. In one of them, when it left the "Llandovery Castle, was the captain of the ship, Sylvester, who has since died. This boat ultimately contained twenty-four men. It was the only one whose occupants were rescued; its occupants are the only survivors of the "Llandovery Castle". In addition to the captain's boat, another got clear from the port side, and it had in it the first officer and five or six seamen. According to the evidence of the fourth officer, the witness Barton, this was the port cutter. The evidence has shown that at least three of these five boats survived the sinking of the ship. The witnesses Chapman and Barton saw them rowing about at a later period, as well as the captain's boat, the port cutter and boat No. 3." That this boat, No.3, got clear away from the ship was also proved by the fact that a man was taken from it on to the submarine and later handed over to the captain's boat. The Court finally came to the conclusion that " after the sinking of the "Llandovery Castle", there were still left three of her boats with people on board." The judgement then describes the efforts made by the submarine officers to find evidence in support of their belief that the "Llandovery Castle had had troops or munitions on board. "The Captain's boat was hailed by the U-boat, while it was busy rescuing shipwrecked men, who were swimming about in the water. As it did not at once comply with the request to come alongside, a pistol shot was fired as a warning. The order was repeated and the occupants were told that, if the boat did not come alongside at once, it would be fired on with the big gun. The life-boat then came alongside the U-boat. Captain Sylvester had to go on board. There he was accused by the Commander of having eight American airmen on board. Sylvester denied this and declared that, in addition to the crew, only Canadian Medical Corps men were on the ship. To the question whether there was a Canadian officer in the life-boat he answered "Yes". Then the latter, the witness Lyon, doctor and major in the Medical Corps, was taken on board the U-boat. On being told that he was an American airman, Lyon answered, as was true, that he was a doctor. He also answered in the negative the further question whether the "Llandovery Castle" had munitions on board. The U-boat then left the Captain's boat, but after moving about for a little time, returned and again hailed it. Although its occupants pointed out that they had already been examined, the captain's boat was again obliged to come alongside the U-boat. The witnesses Chapman and Barton, the second and fourth officers of the "Llandovery Castle" were taken on board the U-boat and were subjected to a thorough and close examination. The special charge brought against them was that there must have been munitions on board the ship, as the explosion when the ship went down had been a particularly violent one. They disputed this and pointed out that the violent noise caused by the explosion of the boilers. They were again released. The U-boat went away and disappeared from sight for a time. Shortly afterwards the U-boat came again in sight of the captain's boat. It circled round, and so close did it come that the men in the captain's boat were convinced that the U-boat Commander was trying to ram them. This court found as to this that, "there is no conclusive evidence of this, although the suspicion cannot be refuted entirely. The question does not need to be settled, as the two accused cannot be made answerable, even if the commander of the U-boat had intended at the time to sink the life-boat." The life-boat then hoisted a sail and endeavoured to sail away. After a brief period, the occupants of the boat noticed firing from the U-boat. The first tow shells passed over the life-boat. Then firing took place in another direction: about twelve to fourteen shots fell in all. The flash at the mouth of the gun and the flash of the exploding shells were noticed almost at the same time, so that, as the expert also assumes, the firing was at a very near target. After firing has ceased, the occupants of the life-boat saw nothing more of the U-boat." Several members of the crew of the U-boat were called as witnesses for the prosecution and their evidence confirmed all essential points of the British evidence and made it abundantly clear that the firing from the U-boat was directed against the unhappy men and women in the life-boats. "The firing from the U-boat was not only noticed by the occupants of the captain's boat. It was also heard by the witnesses Popitz, Knoche, Ney, Tegtmeier and Kass, who were members of the crew of the U-boat. According to their statements a portion of the crew of the U-boat were on deck during the evolutions of the U-boat, during the holding up of the life-boat and during the interrogation of the Englishmen. Popitz and Knoche took part in the interrogation, and confirm that no proof was obtained of the misuse of the "Llandovery Castle." After the examination was completed, the command "Ready for submerging" was given. The whole of the crew went below deck. There only remained on deck Commander Patzig, the two accused as his officers of the watch and, by special order, the first boatswain's mate, Meissner, who has since died. Firing commenced some time after the crew had gone below. While firing, the U-boat moved about. It did not submerge even after the firing had ceased, but continued on the surface." This fact that only officers and Meissner, and experienced gun-layer, were on deck during the firing is sufficiently significant, but other facts were given in evidence by German witnesses. The Court found that "the crew of the U-boat have the same conviction" that the firing was directed against the life-boats. "The witness Popitz was acting in the U-boat as third officer of the watch. In this trial he has given the impression of being a quiet and cautious man. He was on deck when the life-boat was hailed, but went below before the order to prepare to dive was given, in order to work out the position where the torpedoing had taken place. He then lay down in his bunk. From the onwards he heard the shooting He took it for granted at once, as there was no question of any other enemy, that the life-boats were being fired at. The witness Knoche was the chief engineer of U-86. He also was below when the firing took place, but he also assumed that it was connected with the life-boats. He says that he first set the idea aside, as he did not at all like it. He did not want to know what was going on on deck. Some days later he was talking to Popitz about the occurrence and told him that he (Popitz) could not have done it. Patzig answered him that he could never do it a second time. It is unthinkable that this conversation could have related only to the torpedoing of the "Llandovery Castle", and not also to the subsequent shooting which took place. A short time after the firing, Patzig summoned the accused and the crew to the control room and there extracted promises of secrecy from them. The Court naturally assumed from this that the officers has "reason to fear the light of day," and that their fear can only " have been the firing on the life-boats." Two captured British mercantile marine officers were also on board and promises of secrecy till the end of the war were extracted from them also. Both these men were called as witnesses at the trial. "It is very much to their prejudice that in this trial they have refused, when called upon, every explanation on essential points, on the ground that they had promised Patzig to be silent with respect to the occurrences of the 27th June, 1918.The promise of silence which they gave to Patzig..can only lead to the conclusion that events which deserve punishment did take place. If the firing could be explained in any other way, it cannot be imagined that the agreement of the accused to maintain silence could prevent them from denying the firing on the life-boats. If the promise to maintain silence, which he extracted from the accused, covered no more than the torpedoing, Patzig would certainly have found ways and means of releasing his subordinates from this promise, after proceedings had been instituted against them. But, on the contrary, he endeavoured to bind to silence the remainder of the crew of the U-boat with regard to the events of the 27th June. He laid emphasis in his speech on the fact that, for what had taken place, he would be responsible to God and to his own conscience. It is hardly necessary to draw attention to the fact that behaviour of this nature on the part of a commander towards his crew is unusual and striking. Although Patzig is this speech may have made no special mention of gun-fire, he certainly would have alluded to it specially, had not his request for silence covered the subsequent firing. The view of the crew that the shooting was directed entirely against the life-boats cannot have been hidden from him. It was also entirely within his power to correct this opinion when he was speaking to them about the events of the 27th June, and to explain to them, if their opinion was wrong, the real object of the firing." "It is clear that by every means Patzig has endeavoured to conceal this event. He made no entry of it in the vessel's log-book. He has even entered on the chart an incorrect statement of the route taken by the ship, showing a track a long way distant from the spot where the torpedoing occurred, so that, in the event of the sinking of the "Llandovery Castle" becoming known, no official inquiries into the matter could connect him with it." In consequence of this concealment the German Admiralty knew nothing of the sinking of the "Llandovery Castle" and, when the British Government sent a protest to Berlin, via Spain, the German Government denied that the ship had been sunk. Having considered all these facts, the Court unhesitatingly came to the conclusion that the firing was directed against the life-boats. "The prosecution assumes that the firing of the U-boat was directed against the life-boats of the "Llandovery Castle," The Court has arrived of the same conclusion. The Court has decided that the life-boats of the "Llandovery Castle" were fired on in order to sink them. This is the only conclusion possible, in view of what has been stated by the witnesses. It is only on this basis that the behaviour of Patzig and of the accused men can be explained. "The crew of the U-boat have the same conviction. During the following days they were extremely depressed. A subsequent collision with a mine, which placed the U-boat in the greatest danger, was regarded as a punishment for the events of the 27th of June." "The captain's boat cruised about for some thirty-six hours altogether. On the 29th June, in the morning, it was found by the English destroyer "Lysander." The crew were taken on board and the boat left to its fate. During the 29th June, the commander of the English Fleet caused a search to be made for the other life-boats of the "Llandovery Castle." The English sloop "Snowdrop" and four American destroyers systematically searched the area, where the boats from the sunken ship might be drifting about, The "Snowdrop" found an undamaged boat of the "Llandovery Castle" nine miles from the spot on which the "Lysander" had found the captain's boat. The boat was empty, but has been occupied, as was shown by the position of the sail. Otherwise the search, which was continued until the evening of the 1st of July, in uniformly good weather, remained fruitless. No other boat from the "Llandovery Castle" and no more survivors were found." The commanders of the Lysander and Snowdrop (Commanders F.W.D. Twigg, O.B.E., R.N., and Commander G.P. Sherston, R.N.) were called as witnesses to prove these events. Both were splendid examples of British naval officers, and greatly impressed the Court. They were in uniform when they gave evidence, and one was proud to contrast them with the brutal wretches who had torn up every tradition of the sea. "With regard to the question of the guilt of the accused, no importance is to be attached to the statements put forward by the defence, that the enemies of Germany were making improper use of hospital ships for military purposes, and that they had repeatedly fired on German life-boats and ship wrecked people. The President of the Court had refused to call the witnesses on these points named by the defence. The defence, therefore, called them direct. In accordance with the rules laid down by law the Court was obliged to grant them a hearing. What the witnesses have testified cannot, in the absence of the general and exhaustive examination of the events spoken to by them, be taken as evidence of actual facts. The defence refused a proposal for a thorough investigation of the evidence thus put forward. For the defence there were also called two witnesses who said that it was a universal conviction in the minds of all German naval officers during the later years of the war that hospital ships were being abused, and that, therefore, they ought to be regarded as ships of war. One of these witnesses (Dr. Trofer) went so far as to say that German submarine commanders fully believed that any destruction of enemies which would injure the enemy nations was justifiable. The other (Vice-Admiral von Trotha) declared that, as the severity of the U-boat warfare increased, submarine commanders were convinced that no feelings of humanity must be allowed to check their efforts. He added to this significant admission the naïve statement that it never occurred to a submarine commander that there would be any punishment of their duty to the Fatherland. In fairness it must be said that these witnesses, having been out of Court during the trial, did not know the details of the charges against the accused men. When Admiral von Trotha was told what the charges were, he could only say that he could not imagine how such incidents could have occurred. The Naval Expert (Corvette-Captain Saalwachter) then addressed the Court. He was a marked contrast to General con Fransecky, the Military Expert in the prison camp cases. He made no attempt to justify brutality. I was told that he was one of the most brilliant young men in Germany, and that his record had bee one long series of honourable achievements. My impression of him was that he was a fair and able man, struggling to do his best to put the most favourable light upon conduct of which, at heart, he thoroughly disapproved. He advanced many ingenious theories which might account for the conduct of Patzig and the accused. He suggested, for instance, that the life-boats which had got away form the ship and which had disappeared might have been destroyed by wreckage coming up from the sunken ship. But the Court swept all his suggestions aside. As an expert, he placed no importance upon the severity of the explosion when the ship was sunk by the torpedo. Various witnesses had alleged that the severity of the explosion was proof that the ship was carrying munitions, but the Naval Expert admitted that it was impossible to distinguish by the sound an explosion of the boilers from an explosion of munitions. He emphasised the necessity of submarine commanders being suspicious, even of life-boats, and made great play with the British ""Panic Parties ", which had been so successful a ruse in attacking U-boats. He praised the accused men for keeping silence, and urged that they had pledged themselves to their commander. He disputed the view that the accused officers could have refused to obey their commander. The State Attorney opened his speech by saying that, in his forty years' experience, he had never had to shoulder so difficult a task. "I have." He said, "to accuse two German officers of the most serious charge known to our German code." He went through the story of the sinking and the firing, and accepted nearly all the evidence that had been given. He said that he had no doubt that at least three life-boats, fully loaded, had reached safety when the ship finally sank. He said it was also quite clear that, besides the captain's boat, at least one other was investigated by the submarine. He said that the legality of the torpedoing of the "Llandovery Castle" was not a matter at issue at this trial, and added that the Court was also not concerned with the question whether England had ever misused hospital ships. " We are only concerned here," he said, " with what happened after the sinking." He was convinced that the object of the firing was to exterminate the survivors from the ship. He submitted that this intention was not formed until after the examination of the life-boats has been concluded. There was no necessity, according to his view, that the court should be clear about who actually fired the gun; Patzig and the accused had acted jointly, and were jointly responsible. He urged that the accused officers would have been justified had they refused to obey the order to fire. He took the view that it was not proved that any deaths had occurred as the result of the firing, and, therefore, he only asked for a verdict of attempted murder. He asked for sentence of four years' hard labour in each case. During his speech, the State Attorney commented very severely on the conduct of Patzig. "I have no doubt," he said, " that Patzig knew and knows that his subordinates are being held responsible for these events. It would be natural and his duty for him to appear to tell the truth. If Patzig believes that he, and not the accused officers, is guilty, he should come before the Court." He characterised Patzig's conduct as "colossal meanness" and "cowardice." He was convinced that Patzig's absence meant that he knew that all three officers were guilty. This speech aroused real anger in defending counsel. Both made political speeches, denouncing England for her "hunger blockade" ; one of them quoted Scripture and spoke of German's mote and England's beam. There was, they said, no question of the accused having committed any breach of the laws of nations. One of the defending counsel went so far as to say that it was necessary to destroy the men and women in the life-boats in order to prevent them from reaching their homes and rejoining the war against the Fatherland. The Court showed considerable irritation during these speeches. In its judgement the Court found that " the act of Patzig is homicide." Contrary to the view of the State Attorney, the Court held that life-boats were hit and their occupants killed by gun-fire. The Court finds that it is beyond all doubt that, even though no witness had direct observation of the effect of the fire, Patzig attained his object so far as two of the boats were concerned. The universally known efficiency of our U-boats crews renders it very improbable that the firing on the boats, which by their very proximity would form an excellent target, was without effect. Three boats escaped when the ship sank. In view of the danger of being drawn into the vortex of the sinking steamer, they had rowed away, and they were then in the open sea where only the perils of the sea surrounded them. These, however, at the time were not great. The wind and sea were calm. There is, therefore, no reason why the two missing boats, as well as the captain's boat which was rescued, should not have remained seaworthy until the 29th of June, 1918, when, after the latter had been picked up, a search was made in the neighbouring waters. This search was thoroughly carried out by five warships, without a trace of either of the boats being discovered. The empty boat, which was encountered by the "Snowdrop," was evidently, having regard to the position where it was found and the description which was given of it, the abandoned boat of the captain. If the question is asked--what can have induced Patzig to sink the life-boats, the answer is to be found in the previous torpedoing of the "Llandovery Castle." Patzig wished to keep this quiet and to prevent any news of it reaching England. He may not have desired to avoid taking sole responsibility for the deed. This fits in with the descriptions given of his personality. He may have argued to himself, that, if the sinking of the ship became known (the legality of which he, in view of the fruitlessness of his endeavours to prove the misuse of the ship, was not able to establish), great difficulties would be caused to the German Government in their relations with other powers. Irregular torpedoings had already brought the German Government several times into complications with other states, and there was the possibility that this fresh case might still further prejudice the international position of Germany. This might bring powers that were still neutral into the field against her. Patzig may have wished to prevent this, by wiping out all traces of his action. By sinking the life-boats he purposely killed the people who were in them. On the other hand no evidence has been brought forward to show that he carried out this killing with deliberation. Patzig, as to whose character the Court has no direct means of knowledge, may very well have done the deed in a moment of excitement, which prevented him from arriving at a clear appreciation of all the circumstances, which should have been taken into consideration. The crew of the submarine, in consequence of the highly dangerous nature of their work, live in a state of constant tension. The Court decided that the resolution to exterminate the survivors was only made after the fruitless efforts to obtain evidence which would prove that the "Llandovery Castle" was being used for the transport of troops and munitions. This finding is important on the question, whether the crime of the accused amounted to murder or manslaughter. The Court decided that murder had not been committed. Several factors were present in this case, which tended specially to deprive Patzig of the power to arrive at a calm decision. He has said that he would torpedo a hospital ship, with all its characteristic markings, in the expectation of being able to prove that it was being used for improper purposed. His hope was in vain. In spite of the most minute investigation, it was not possible for him to obtain any confirmation of his assumption. Then arose the question, how could he avert the evil consequences of his error of judgement? He had to decide quickly; he had to act quickly. The two accused knowingly assisted Patzig in this killing, by the very fact of their having accorded him their support. It is not proved that they were in agreement with his intentions. The decision rested with Patzig as the commander. The others who took part in this deed carried out his orders. It must be accepted that the deed was carried out on his responsibility, the accused only wishing to support him therein. A direct act of killing, following a deliberate intention to kill, is not proved against the accused. They are, therefore, only liable to punishment as accessories. Patzig's order does not free the accused from guilt. It is true that according to the Military Penal Code, if the execution of an order in ordinary course of duty involves such a violation of the law as is punishable, the superior officer issuing such and order is alone responsible. However, the subordinate obeying such an order is liable to punishment, if it was known to him that the order of the superior involved the infringement of civil or military law. This applies in the case of the accused. Military subordinates are under no obligation to question the order of their superior officer, and they can count upon its legality. But no such confidence can be held to exist, if such an order is universally known to everybody, including also the accused, to be without any doubt whatever against the law. This happens only in rare and exceptional cases. But this case was precisely one of them, for in the present instance, it was perfectly clear to the accused that killing defenceless people in the life-boats could be nothing else but a breach of the law. As naval officers by profession they were well aware, as the Naval Expert Saalwachter has strikingly stated, that one is not legally authorized to kill defenceless people. They quickly found out the facts by questioning the occupants in the boats when these were stopped . They could only have gathered, from the order given by Patzig, that he wished to make use of his subordinates to carry out a breach of the law. They should, therefore, have refused to obey. As they did not do so, they must be punished. If Patzig had been faced by refusal on the part of his subordinates, he would have been obliged to desist from his purpose, as then it would have been impossible for him to attain his object, namely, the concealment of the torpedoing of the "Llandovery Castle." This was also quite well known to the accused. In estimating the punishment, it has , in the first place, to be borne in mind that the principal guilt rests with Commander Patzig, under whose orders the accused acted. They should certainly have refused to obey the order. This would have required a specially high degree of resolution. A refusal to obey the commander on a submarine would have been something so unusual, that it is humanly possible to understand that the accused could not bring themselves to disobey. That certainly does not make them innocent. They had acquired the habit of obedience to military authority and could not rid themselves of it. This justifies the recognition of mitigating circumstances. A severe sentence must, however, be passed. The killing of defenceless shipwrecked people is an act in the highest degree contrary to ethical principles. It must also not be left out of consideration that he deed throws a dark shadow on the German fleet, and specially on the submarine weapon which did so much in the fight for the Fatherland. For this reason a sentence of four years' imprisonment on both the accused men had been considered appropriate. Further, the accused Dithmar is ordered to be dismissed the service, and the accused Bolt is deprived of the right to wear officer's uniform. The behaviour of the accused during the proceedings has not been such as to justify reducing the period of imprisonment by the comparatively short period, during which they have already been detained. The decisions of the Court in this trial give rise to many important considerations, and these will be discussed later. When the accused men received sentence, they remained stolid and unmoved. Neither had shown much emotion during the trial. Bolt struck me as a real brute, but Dithmar seemed to me less guilty then either Boldt or their absent commander, Patzig. Had Dithmar given evidence I think he might have been able to minimise his responsibility for the joint crime. Major Lyon, the doctor who was ordered out of the captain's boat on to the submarine, told the Court that, as he was leaving the submarine, one of the officers took him aside and gave him the hint " to clear off at once." In the life-boat Captain Sylvester told that he had been given a similar hint. It was clear that the officer who had said this was Dithmar; he may have been inwardly anxious to prevent success following the murderous intentions of his commander, which he was too cowardly to resist. This tallied fully with my reading of his character. But as both Dithmar and Boldt refused to give evidence, both had to share the same fate. An important point arising out of this is that, if Dithmar gave this hint, he must then have known what the intentions of Patzig were. If this was so, Patzig's intentions could not have been formed suddenly, but must have been formed at least while the investigations were proceeding. When the judges had withdrawn, I say several members of the public go up to the condemned men and sympathize with them. There was an electric atmosphere both in the Court and amid the crowd outside. The British Mission retired quietly to its private room, and then left the Court by a side-door, closely guarded by German police. Thus the possibility of any unpleasant incident was avoided. A Canadian Victory Bond poster showing a Canadian soldier holding a dead Red Cross worker shaking his fist at the U-boat that had torpedoed the HMHS Llandovery Castle.